We developed the Consultant roles because although we provide paid work for a lot of people with learning disabilities, we wanted to offer a further opportunity for growth and development within the charity. Pam has been chair of the MLMC trustees for 3 years, before stepping down to become a consultant. She is one of our most experienced Power Up Trainers, co-facilitates the Oxford group, works as a MLMC Expert by Experience and inspector, and help to run Stingray Nightclub. 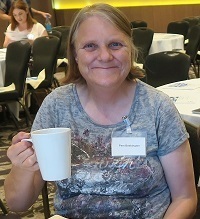 She has been a regular attendee of the Banbury group since it started 8 years ago. Shaun is a Travel Buddy Trainer, Power Up Trainer, Expert by Experience for the CTR programme, Wantage group member, and helps to run Stingray Nightclub each month. He has delivered presentations at a number of different national events, including co-chairing the NDTi conference in 2016. Dawn has been part of My Life My Choice for over 10 years, and has played a key role in almost all of our projects. Currently she is a Travel Buddy trainer, Oxford group member, Power Up Trainer, Quality Checker, expert by experience for CQC, and helps to run Stingray Nightclub each month. 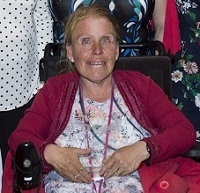 Jackie has been a long time trustee of MLMC, before stepping down to work as a Consultant. She is also a Travel Buddy, Power Up Trainer, CQC expert by experience, and helps to run Stingray Nightclub each month. The MLMC office would not function without Jackie answering phones, posting our Includer newsletters, and making sure the kitchen is always stocked with tea, coffee, milk and sugar!